Home to about 3,796 undergraduates in 2017, Bethune - Cookman University is a small, private university located in Daytona Beach, Florida. This urban setting might be best suited for students who like the fast-paced city life. Should you tire of the campus however, Bethune - Cookman University offers a "study abroad" program. Please note, some classes/degrees offered by Bethune - Cookman University can be taken "online" so keep that in mind when reviewing this report. For more context, you might also check out our Bethune - Cookman University Guide to Distance and Online Learning. The Higher Education Act of 1965 established historically black colleges and universities as institutions whose principal mission was the education of African-Americans. Today, the HBCU designation does not necessitate that Bethune - Cookman University is exclusively or even predominantly African-American (though it currently is). Thanks to integration efforts, there are HBCUs with non-black majorities and non-HBCUs with black majorities. For more information you can review the White House Initiative on Historically Black Colleges and Universities. Bethune - Cookman University is Affiliated With the United Methodist Faith. Like many colleges with a religious affiliation, Bethune - Cookman University is not "faith based" and is therefore unlikely to require a religious studies component. If an affinity with the United Methodist faith interests you, check out our ranking of The Best United Methodist Colleges and Universities. For more information on policies and accommodations that the university provides to ensure all students get the opportunity to participate, you can visit Bethune - Cookman University Disability Services. While not a "service academy", Bethune - Cookman University does offer support for veterans and those seeking a career in the armed forces. Undergraduates have access to one or more ROTC programs and there is an active student veterans group on campus. For more information, check out our Bethune - Cookman University for Veterans Guide. 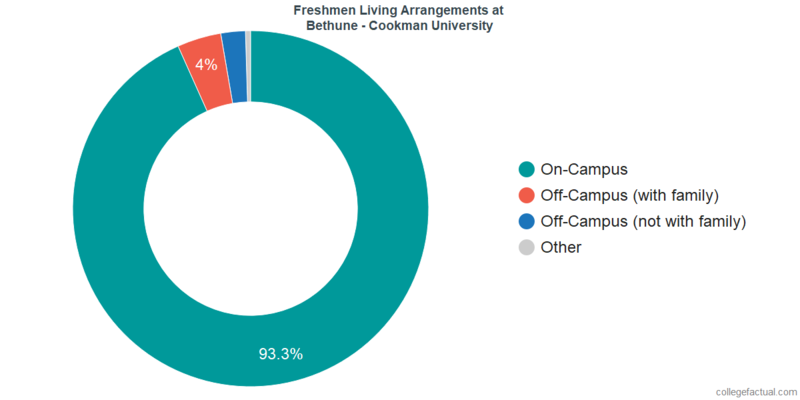 Bethune - Cookman University offers on-campus housing, but freshmen are not required to take advantage of it. In the end though, most do choose to live in the dorms. Bethune - Cookman University has a comparatively small, student body. There were 3,796 undergraduates in 2017. Full-time attendance was 3,584 (94.4%). Part-time attendance was 212 (5.6%). 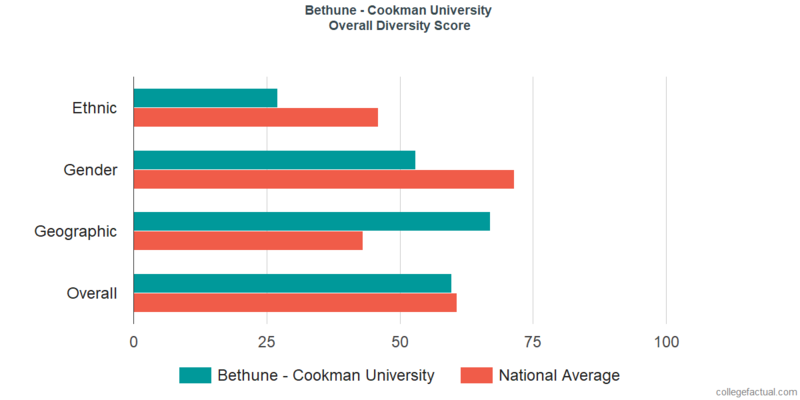 Compared to other colleges and universities across the nation, Bethune - Cookman University is less diverse than average in terms of overall diversity. We rank Bethune - Cookman University #1444 out of 2,238. You can learn more about the diversity of the student body at Bethune - Cookman University by looking closer at the ethnic, gender, age, and geographic diversity metrics from the Bethune - Cookman University Diversity Guide. Bethune - Cookman University has a total of 374 student athletes, 233 men and 141 women who compete in inter-collegiate athletics.